High-sensitivity Garmin GPS/GLONASS transmitter, enhanced map drawing capabilities, BirdsEye Satellite Imagery compatibility and a 3-axis electronic compass ensures you get to your truck or camp at the end of the hunt. The Astro 320 handheld takes dog tracking to a higher level. 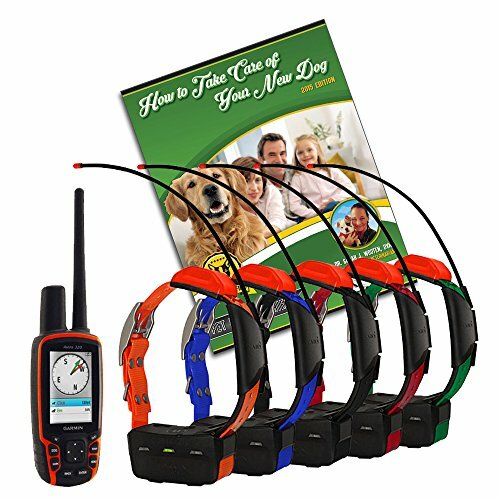 It allows you to keep track of up to 10 dogs with multiple handsets and T5 dog devices. See Your Dogs’ Every Move: The T5 has a top-mounted GPS antenna and is designed to keep its stainless steel radio antenna upright for the best reception. And it’s tough enough to run wherever you dog runs (water-rated to 10 meters). You can track up to 10 dogs at one time with Astro, at a range of up to 9 mi away, depending on terrain. The system transmits information by line-of-sight, so it reaches farthest in flat, open territory. As often as every 5 seconds, the T5 dog device transmits your dog’s position to your Astro 320 handheld. Through the vibrant display, you can see your dog’s current location and a trail of where he’s been on the map page. Switch over to the Dog Tracker page to view a compass pointing to your dog’s location. When tracking multiple dogs with T5 dog devices, you can also see each dog’s precise distance on the map page, and you can choose to auto zoom the map so all dogs can be seen on the display at any time. Dogs that are too far away to fit on the map’s current zoom scale can be notated on the display’s margin in the direction of the dog’s location. You can also choose the duration that each dog’s track log is viewed on the display, or toggle it off completely. Special Features for Your Peace of Mind: Rescue mode provides a reduced update rate when battery life drops below 25 percent in order to preserve battery life and give you more time to look for a lost dog. The improved battery life means when you set your update rate to every 5 seconds, the battery lasts 26 hours. In rescue mode, the battery lasts 54 hours. Plus, Collar Lock creates a 4-digit PIN number that helps prevent others from seeing your dog’s whereabouts – a useful feature in field trials to ensure an Astro is used only as a search tool when a dog in competition becomes lost.